We all have different visions of a Ferrari. For many of us, at least those of us who have reached a certain age, our first experience driving a Ferrari came in the Sega classic Out Run. But Ferrari has a new and different vision for us. And that's this: The all-wheel drive Ferrari FF I had the chance to drive. In Out Run, just a few arcade tokens earned you the opportunity to race down a perfectly smooth road along a perfectly scenic beach with your perfectly blonde mistress cheering you on from the lone passenger seat. Drifting past slower traffic without crashing wasn't particularly difficult, but should you manage to hit a palm tree there was still no reason to fret. The car would tumble, safely deposit you and your significant other by the side of the road and then magically re-appear, right-side up and ready to resume. Believe it or not, here in the real world there exists a Ferrari that is equally at home screaming around perfectly smooth tracks as it is making its way across cracked and crumbling roads. It has a 651 horsepower V-12, accelerates from 0-to-60 in 3.7 seconds, can take you down the road at 208 MPH, seats four (reasonably) comfortably, and has one of the most technologically advanced transmission and differential setups ever seen in a car. Can it possibly be worth its asking price of $300,000? Put those grubby tokens back in your pocket because we're going to take this real-world supercar for a spin to find out. Skeptics will call the FF one of the more boring looking Ferraris of the past few decades, while those of a somewhat more optimistic disposition might find it muscular and purposeful. Like the similarly mis-proportioned BMW M Coupe before, opinions will certainly be mixed. Me? I like it. The wide stance, massive wheels wrapped by swollen fenders, is muscular and powerful — but there's no ignoring the generous posterior necessitated by that rear hatch. Yes, you could call this the world's fastest station wagon, but I'm more inclined to call it a particularly hot hatch. Virtually every styling cue points to power and aggression: quad exhausts flanking a generous aerodynamic splitter; vents or intakes on all four fenders; the bulging hood, which looks to be vacuum-sealed over that massive, red-headed 6.3-liter V-12. Seen from the front the FF seems to scowl at you, a menacing look in the rear-view of those ahead. Move to the side, though, and the FF almost seems to flash a cheeky grin. Less intimidating, sure, and a sign of the bi-polar nature of this machine. Our test car was fitted with (optional) 20-inch wheels featuring a split five-spoke design and a matte color that I found quite visually pleasing without drawing attention away from the shapely aluminum bodywork. Those wheels are wrapped with wafer-thin Pirelli P Zero tires, a seemingly punishing 245/35 sidewall height that is somehow made reasonably comfortable thanks to some suspension trickery we'll discuss a little bit later. The Ferrai FF's door is long and it is heavy. It doesn't swing upward with the theatrics of the Mercedes SLS or McLaren MP4-12C, nor does its handle automatically extend in a welcoming gesture like on the Tesla Model S. It is a car door in a very typical sense. Ferrari does not offer a choice of seat designs in the FF, so thankfully the default is a good one, managing to be both comfortable and sporty — not to mention endlessly customizable. Powered controls nestled down in a traditional spot on the side near the floor move your throne up and down and in the usual directions, also enabling discrete adjustments for both the upper and lower bolsters, meaning you can get as much or as little support as you like. A trio of buttons allow you to program and save three configurations, enabling quick toggling between squeezy and comfy while still leaving a third setting free for a (very) special someone with whom you share the key. As you'd expect from a driver-focused machine like this, once seated virtually everything falls quickly to hand. The vast majority of the car's controls have been sprinkled on and around the steering wheel, as we'll discuss in a moment, but lucky drivers won't have to stretch far for their fingers to find the rest. Window controls are found between the seats, just below a little padded cubicle that's perfect for housing a phone while in motion. This cubbie is framed by arcing grab handles, carbon fiber in our car (you can get them leather-wrapped if you prefer) and perfectly positioned to accept the white knuckles of a timid passenger. Those handles flow into a control that houses three large buttons for enabling launch control, setting the transmission into automatic, and shifting into reverse. Continuing to climb up the center stack you'll find the dual-zone climate controls, a series of satisfying physical knobs and buttons and then, finally, the main infotainment system. It's a JBL system, unremarkable in every respect. A trio of circular air outlets mark the center of the dash, with one more on each the far left and far right of the cockpit. Each offers a soft-touch knob in the center to open and close the vent within, and if you look closely you'll spot the embossed prancing horse. Details count, and there are plenty to be found here. On the dash to the left of the steering wheel you'll find the headlight controls (which you can just leave on auto if you like) and a fiddly little knob that's cheekily labeled "pit limiter." That's Ferrari's euphemism for cruise control, and while it's functional (push to turn on, twist to the right to speed up, left to slow down) the knob is poorly placed and rather clumsy to operate. No, adaptive cruise control is not an option. 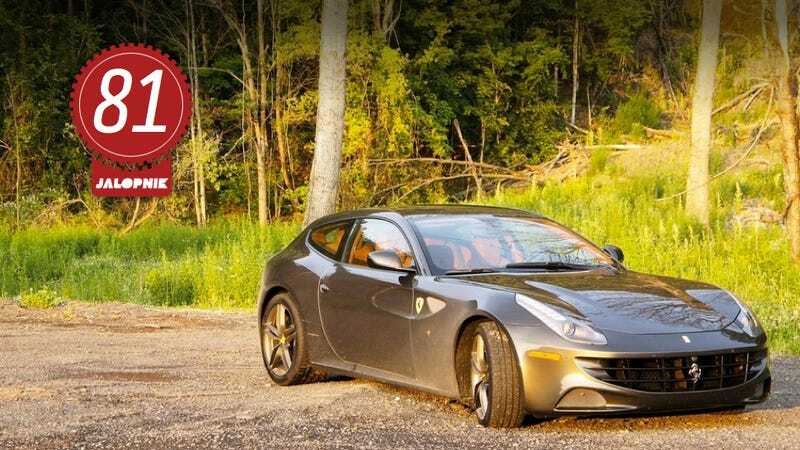 Yes, this is a Ferrari and some would argue you shouldn't ever use cruise control anyhow, but remember: This is meant to be a practical Ferrari, which includes road-tripping and excelling at long highway cruises. There's a 24-gallon tank in here for a reason. The lack of a clutch pedal makes launching the FF a very simple thing. Brisk getaways are simply a matter of mashing your right foot to the floor and, optionally, hooting and hollering a bit. If you want to get really serious, though, come to a complete stop and hold the button labeled "PS" for a moment. This, the Partenza Sportiva button ("sport departure" in Italian), enables launch control. Press firmly on the brake with your left foot while applying liberal throttle with your right. The FF will hold revs and, when you side-step the brake pedal, accelerate up to 60MPH in roughly 3.7 seconds. That's properly fast, but interestingly it's also surprisingly comfortable for an AWD car with this much power. The car seems to spend just a fraction of a second figuring out how much grip it has, rear-end squirming around slightly, before it truly launches and really opens your eyes with acceleration. This is in direct contrast to the 2.9 second 0 - 60 run on a Porsche 911 Turbo S, which, though almost 100 horsepower short of the Ferrari, feels like getting rear-ended by a Saturn V rocket. Both experiences are quite satisfying, mind you, but if I had to guess I'd say Ferrari's is a little more kind on the drivetrain. When you're already rolling at moderate speeds the FF is very tractable when it comes to throttle response, forgiving those with an over-eager right foot. It isn't until that analog tachometer starts swinging to the right that the response really wakes up. The V-12 is far from lazy at low RPMs, but it definitely encourages a quick downshift or two. Those who make good use of the seven-speed transmission to keep the engine in its power band will be rewarded. The carbon ceramic brakes on all four corners proved extremely capable in all conditions, providing immediate bite and great feel even when wet and cold. The car's ABS is aggressive, making the tires chirp and squeal with displeasure before letting off. Even when hot and smelly there was never a hint of fade, though I needed little more proof of the braking system's effectiveness than a single hard stop necessitated by a farmer on his John Deere not looking both ways before pulling out of his pasture. There, despite a road surface littered with wet gravel and manure and other unsavory things, the FF tracked straight and true as it came to a prompt stop. I was quite impressed. So, too, the farmer. I covered nearly 500 miles in the car, including a few long stretches of highway that the FF Hoovered up without complaint. In top gear, the engine is barely idling at such cruising speeds, spinning at just over 1,000 RPM and doing its best to be as frugal as possible — managing just a little over 16 MPG highway by my account. Over those 500 miles of combined driving I averaged just 14.1 MPG total. That's hardly Prius territory but, if you consider this car has as much power as nine Toyota hybrids, you might feel a bit better about its efficiency. Maybe. I sampled numerous winding back roads with a variety of surfaces ranging from freshly paved asphalt to flood-damaged gravel in a variety of weather conditions. Sadly, ice and snow was right out given the time of year, but I did get caught in multiple torrential downpours of the sort that would send your average Ferrari owner cowering for shelter. The FF, I'm happy to say, ate it all up with a fork and never left me wanting to do anything but turn around and do it all over again. Though I wouldn't necessarily recommend the FF if you plan to spend a lot of time on gravel roads, it did just fine there, too. In the interest of paint preservation I kept the speed down, but with the suspension on its softest setting I got through a series of Irene-damaged, rock-covered roads with neither drama nor herniated discs. Indeed, with the (optional) suspension lift the FF can even make it over speed bumps without the scrapes and grimaces elicited by your average Ferrari. The softer suspension settings are also perfect for covering miles on old concrete highways whose expansion joints have well and truly expanded. When its time to hop back on the twisty bits, a quick turn of the dial and everything cinches back down again, suspension getting firm and transmission banishing all auspices of gentleness in favor of brutally quick shifts. Powerful V-12s and Ferraris go together like two things that go very well together indeed, but its the way in which that power is delivered to the ground that sets this car apart. The FF is Ferrari's first production all-wheel drive car and, while various manufacturers have tried various approaches to getting the power from a single engine to four wheels, Ferrari's approach is quite distinctive. Engines are usually the heaviest single thing in a car and so, for optimal handling, putting them as low and as close to the center as possible is key. The FF uses what's called a mid-front engine layout, with the mass of the engine situated in front of the driver but behind the front axle. This poses a problem: How do you get the power back out of the engine to the rear wheels but also push it through the front to the wheels out there? Ferrari's solution is called 4RM and it's basically a second transmission and differential mounted to the front of the engine. I could go on for pages about how this compares to traditional viscous and clutch-based AWD systems used on the WRXs and GT-Rs of the world, with their transfer cases and secondary driveshafts, but I'll stick to the primary advantages. 4RM lets Ferrari engineers place the engine exactly where they want it and, perhaps more importantly, it allows the traction control system full control over where the power goes. The system can be fully locked, giving equal power to all four wheels when traction is low. Or, when there's plenty of grip and you want a Ferrari that feels like a traditional Ferrari, the front differential can be completely de-activated, sending all six-hundred and fifty-one ponies directly to the rear wheels. The differentials can even vector torque to the left or right, helping to sling you around corners like a Batmobile on a tethering hook (Or, at least, like a car that weighs a lot less than this one.). The system proved incredibly proficient at keeping me pointed in the right direction at all times, handling both brisk acceleration and sustained throttle through corners tight and wide. I had fears of an understeer-biased car but they were quickly silenced, the torque-vectoring front wheels seeming to help pull the nose around turns rather than push it through them as on many AWD sedans. While this is a big, heavy car (4145 pounds, 900 more than the 458) it somehow feels nimble on all surfaces. Still, its length and width give it a reassuringly planted feeling. The transmission has seven gears on offer, selectable via carbon fiber paddles mounted to the steering column behind the wheel. No, there is no option for a traditional gated shifter with a clutch pedal. Though one would always envision one's self revving that V-12 to its 8,000RPM redline and shifting with poise and precision, I confess I did occasionally enjoy being able to hit that AUTO button in the center stack to let the car shift itself. In auto the car isn't quite as smooth as your typical slushbox, struggling a bit to pull away from stop lights cleanly for example, but when the steering wheel-mounted mannetto is set to Comfort the FF gives generally smooth and, yes, comfortable shifts. But, dial it up to Sport and the shifts are rapid-fire quick. The car gives you the gear as soon as you want it and, should you be downshifting, will rev-match for you. The best sound the FF can make of course originates under the hood and is channeled through the quad pipes around back. But, there is a JBL 7.1 QuantumLogic sound system on offer here, 15 speakers and a total of 1,280 watts worth of amplification. That'll set you back an additional $5,823, a pittance compared to the cost of the car and, we'd say, well worth it. The stock sound system, while more than adequate, doesn't compare. Perhaps the most satisfying, and probably the most advanced, toy in this car is the one the driver will be touching most frequently. Lifted straight from the fire-breathing 458 Italia and heavily influenced by Ferrari's Formula One exploits, the wheel in the FF does away with column-mounted stalks and replaces them with a barrage of buttons and knobs that will make any PlayStation Generation driver swoon with glee. Though it certainly takes some adjusting to, I found myself quite endeared to it after just a few hours. Below this on the right is the manettino, a bright-red, five-way toggle for quickly switching between pre-configured driving modes. Starting at the bottom you have snow then wet then comfort and then sport, with a fifth position requiring you twist and hold the manettino for a moment. This is for those spicy moments when you want to disable traction control. Clicking your way clockwise from one position to the next is like handing the car successive cups of espresso before finally giving it a shot of adrenaline. Things starts out sleepy, then sluggish then awake — and then, if you keep turning, it all gets really interesting. The magnetic suspension becomes firmer, throttle and shifts more responsive, and the all-wheel drive system more rear-biased. All the while the traction control becomes gradually more lenient before, finally, checking out altogether. The sheer tactility of toggling between modes is very satisfying in and of itself and, with each click, the left MFD in the gauge cluster pulls up your revised settings for display in a simple, if somewhat crude, bar display. Should you want to manually make the suspension softer still, there's a discrete suspension button over to the left on the wheel, mounted just above the most important one, the red one that shouts ENGINE START. Other than the wheel, though, there are few tricks to be found in the cockpit. As mentioned above the head unit is passable, but basic, offering navigation, SiriusXM and USB connectivity for music playback (or charging your phone). Sadly the model we tested lacked the Siri functionality Ferrari is adding to new FFs, but better voice integration wouldn't do much to help this functional but far from engaging system, with dated graphics, sluggish responsiveness, and limited functionality. For example, while you can pair your smartphone over Bluetooth for making and receiving calls, there is no A2DP wireless audio streaming for music. There is a last-resort line-in, but having to dangle a patch cable across the interior of your $300k car seems wrong. Passenger with display envy? No worries. Tick the appropriate boxes when configuring your Ferrari FF and you can get yet another multi-function display mounted on the far right. This sliver of an LCD shows engine RPM and vehicle speed by default, but with the press of a wee button your lucky, iron-stomached compatriot can toggle through things like trip information and even current suspension and traction control settings. They'll be entertained for minutes, at least, before simply relying on the display to know when you're driving too fast. This will happen frequently. Passengers in the back can have displays, too. These little LCDs inset in the back of the front seats are connected to a composite input situated between the two rear seats. Yes, red / white / yellow composite inputs, an analog throwback that I found less endearing than the non-digital tachometer. HDMI would have been more welcome, but starting this year buyers can opt for a pair of iPad minis instead, which I figure would quite handily keep the little ones in the back from complaining too much about the cramped seating conditions. Even the key is pretty basic, featuring three buttons. One locks the doors, one unlocks the doors, and a third pops the rear hatch — and that's it. To start the car you must insert the metal portion of the key into the steering column and give it a twist before pressing the ENGINE START button on the wheel, spinning that V-12 into life. It's all very traditional, which of course isn't the end of the world when we're talking about a brand like Ferrari, but keyless ignition would certainly be a nice option. It's easy to think of a Ferrari as a toy for the lucky or, indeed, just another unlockable in a videogame, something no more practical than a pink urban camo skin in Modern Warfare. This Ferrari is different. Yes, with a price that starts just under $300,000 and goes way, way up from there, it's still something exclusively reserved for those who have earned (or inherited) a very privileged position in life. However, those with the means will find something truly remarkable: A supercar for the real world. It will never offer the thrilling experience of a 458 Italia nor will it shrug off lengthy Autobahn stretches with the aplomb of something like a Mercedes-Benz S-Class. It's situated somewhere in between those two cars, a position many would call necessarily compromised. However, it's within this space we spend most of our lives, and it's here the Ferrari FF dominates. It's a Ferrari you can genuinely enjoy every day — even with a couple of dogs in the back.